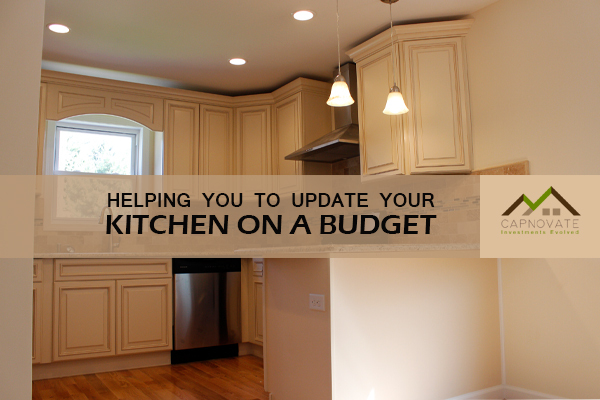 From paint and hardware to DIY projects and sources for budget materials, these 15 ideas will help you plan your kitchen update. 1. Swap out lighting: Stylish new pendant lights can easily become the new focal point of the room. The hand-blown glass pendants shown here are a beautiful, versatile choice, and at less than $200, they won’t break the bank. 2. Add new hardware: Classic hardware is a worthwhile upgrade, subtly enhancing the look and feel of the entire space. Just keep an eye on the price per piece when shopping, because it adds up fast — especially if you have a large kitchen with lots of cabinets. Count the number of pulls and knobs in your kitchen so you can quickly determine if the hardware you have your eye on will fit your budget — with plenty of beautiful pieces available for $10 and under (like the brass pulls shown here) there is no need to blow the budget. 3. Upgrade accessories: With limited opportunities for decoration, it’s important to make the most of the little things. Corral frequently used items on a woven tray, prop up a few wooden boards on your counter and display pantry items with pretty packaging. 4. Repaint cabinets: If your kitchen cabinets have a dated finish or you want a more personal touch than standard-issue white cabinets, think about adding color. Try pale sage green, as shown here, duck egg blue or warm putty — all versatile choices that go with many different materials and finishes. 5. Paint half the cabinets for a high-contrast look: A palette of black and white with wood and metal accents looks sleek and modern in the kitchen. Get the look by painting only the bottom cabinets and the base of your kitchen island black, leaving the upper cabinets white. 6. Add sconces: Swing-arm sconces above open shelving provide lovely ambient light and offer more personality than standard recessed or track lighting. Ideally an electrician would install them with the cords hidden, though it may be possible to use plug-in versions with cord covers concealing the dangling cords. 7. Work in rustic elements: Farmhouse accents instantly add warmth and character to a bland kitchen. Replace the kitchen or pantry door with a sliding barn door, hang copper pots from a ceiling rack or bring in a timeworn antique wooden stool. 8. Add storage with simple shelves: Lacking upper cabinets? Rustic wood shelves on metal brackets are easily (and cheaply) installed, and provide functional display space for everyday dishes. 9. Use Roman shades for a finished look: Roman shades add an elegant note to any room and look especially at home in the kitchen, where any softness is most welcome. Have matching shades made for any glass doors in the same room for a cohesive look. 10. Paint the floor: If your wood floors are not in the best shape and you want to avoid professional refinishing, try painting them instead. White is chic but will show every dropped crumb; pale gray and blue are also classic choices. If you want to get creative, try stenciling a design onto the painted floors. 11. Search Craigslist for budget-friendly building materials: If you’ve been using Craigslist only to search for furniture, you are missing out. 12. Remove upper cabinet doors: If glass door fronts are out of the budget but you want to open up a bit of space, try simply removing the doors to your upper kitchen cabinets. It’s an easy change to make (just unscrew the doors and fill and paint the holes) that can add a sense of spaciousness to a small kitchen. 13. Treat yourself to new dishes: Open shelving and counters are a great opportunity to practice the art of display. You can’t go wrong with classic white dishes and clear glass, but fun mismatched flea market finds would work equally well if that’s your style. 14. Spice up an outdated fridge with chalkboard paint: No cash to trade in that old beige fridge? Try covering it in chalkboard paint instead for a fun, creative look. The chalkboard surface will keep kids busy while you cook, or use it to keep a running grocery list, menu ideas or inspiring quotes and doodles. 15. Make your own beadboard fridge cover: Homeowner Jennifer Grey has undertaken some amazing DIY projects while transforming her fixer-upper cottage, which had been vacant for seven months and was desperately in need of some TLC.